Fair warning, I’m a bit of a data geek. And I’m stubbornly persistant when I come up with an idea that I’m curious about seeing through. 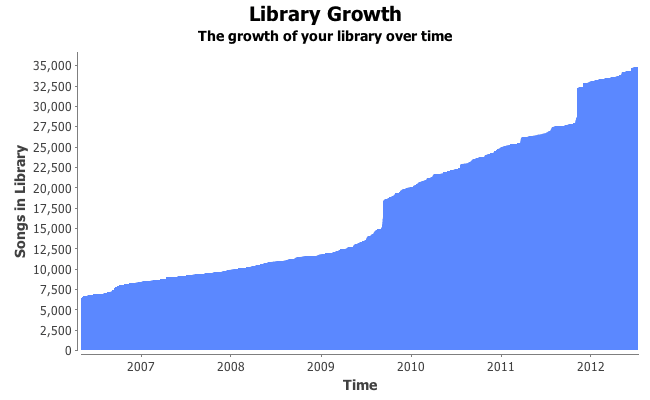 So when I thought about the growth rate of my music collection within iTunes, I simply had to figure out a way to graph it. Exporting the 65mb iTunes Library XML file seemed like a reasonable start, but the file was too large to actually do anything with. Excel crashed. Numbers crashed. Even Google Docs didn’t know what to do with it. Trying to split the file didn’t work well either, as even TextMate could barely handle the file. Sure, I could have done some command line kung-fu, but it was late and I’d never dealt much with XML files before. So I turned to Google. The most common words in song titles read like a strange love poem. I particularly like that the top words are “love your song time“. OK, I can do that. Full report with more graphs here. Did you ever find a way to open that file any other way? I’m wanting to import my exported XML file into a spreadsheet but can’t. Nope, I only used the app. Let me know if you figure out a way to get to the raw data! If I can, I’ll let you know. My library file is 15MB and nothing will open it, which just bugs the heck out of me, when Microsoft Excel is opening 25 MB XLS files for me with no problems. Looks like the only way I was able to get my data into a spreadsheet was my copying it from iTunes list and pasting it into a spreadsheet. (I used LibreOffice). It only copies what you see there, so you won’t get all of the information. But it’s better than nothing.